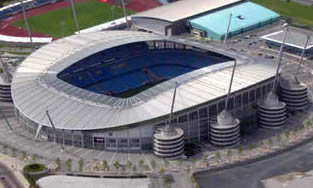 After a 80 year stint at Maine Road, the club moved to the new City Of Manchester Stadium at the start of the 2003 football season. As with many other stadiums built around this time, the stadium is a bowl design and is totally enclosed. The ground was originally built for the Commonwealth games but has since had 10,000 extra seats added to the space occupied by the athletics track. In common with stadiums like the Ricoh, Perspex forms part of the roofing allowing light to reach the pitch. Although subjective - we liked what we saw, the ground is not as bland as some of it's contemporaries. As an away fan you'll find yourself accommodated in the South Stand at one end of the ground where you are treated to great views of the action. The ticket allocation is typically 3,000 with an extra 1,500 for cup games. The facilities are excellent, they are provided within a spacious concourse. There is a good choice of hot half time snacks as well as the opportunity to grab a pint. You can also watch the game on Plasma TV's. We enjoyed our visit to the ground, but not the result as we were soundly beaten on the day. Hopefully next time we can enjoy the result as much as the facilities! Take J19 from the M6 and follow the A556 towards Stockport. Then join the M56 (still heading towards Stockport) Continue past Stockport onto the M60 towards Ashton Under Lyne. Leave the M60 at J23 and take the A635 towards Manchester. Take the A662 towards Droylsden/Manchester. Stay on this road for about 3 miles and you will reach the stadium on your right. Take J18 off the M62 and join the M60 Ashton Under Lyne. Leave the M60 at J23 and take the A635 towards Manchester. Take the A662 towards Droylsden/Manchester. Stay on this road for about 3 miles and you will reach the stadium on your right. If you are a registered user then you can login, and create your own personal review of Manchester City Football Club - City Of Manchester Stadium. These reviews can be private or public.